From the moment we met Aimee and Mike, we fell in love with their oh-so sweet story, and knew we wanted to help bring their spring wedding vision to life. The pair first met at a summer camp they attended together as kids and serendipitously ended up reconnecting years later. They’ve been inseparable ever since. 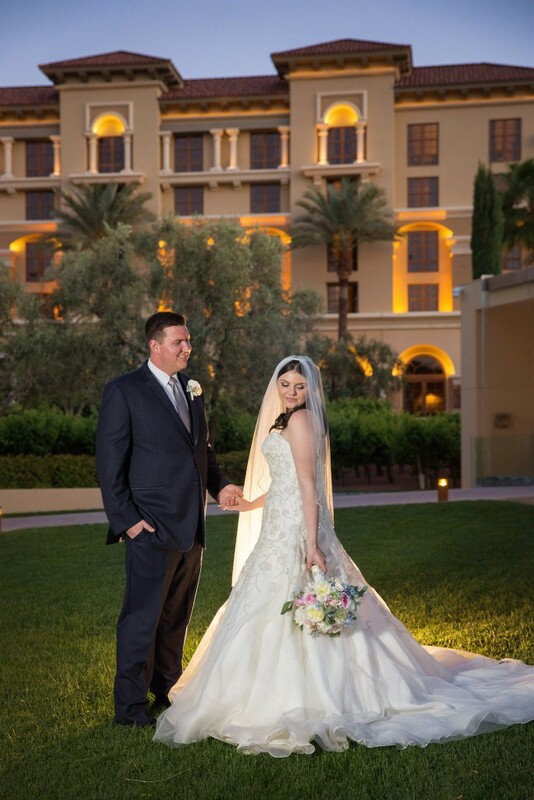 Mike and Aimee chose Las Vegas’ Green Valley Ranch Resort as the setting for their stunning springtime nuptials. They were inspired by the summer camp where they first met and wanted an overall aesthetic that would bring out the natural beauty of the lush, green ceremony setting. They ended up choosing a palette of ivory and blush, which worked so well for their romantic-meets-rustic springtime affair. For the bride’s bouquet, Floral By Dzign worked with soft, spring-inspired hues to create an arrangement chock-full of ivory garden roses, pink roses and light blue bella donna delphinium with dusty miller and eucalyptus accents. We outfitted Mike with a simple ivory rose and dusty miller boutonniere to play into his beautiful bride’s bouquet. 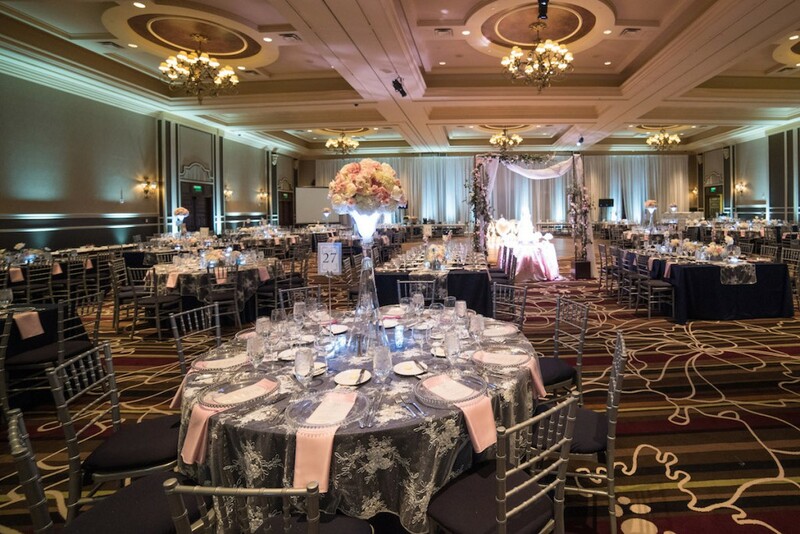 For the ceremony space, we wanted to create something that was whimsical and romantic, and that transported guests to an entirely different world right here in Las Vegas. 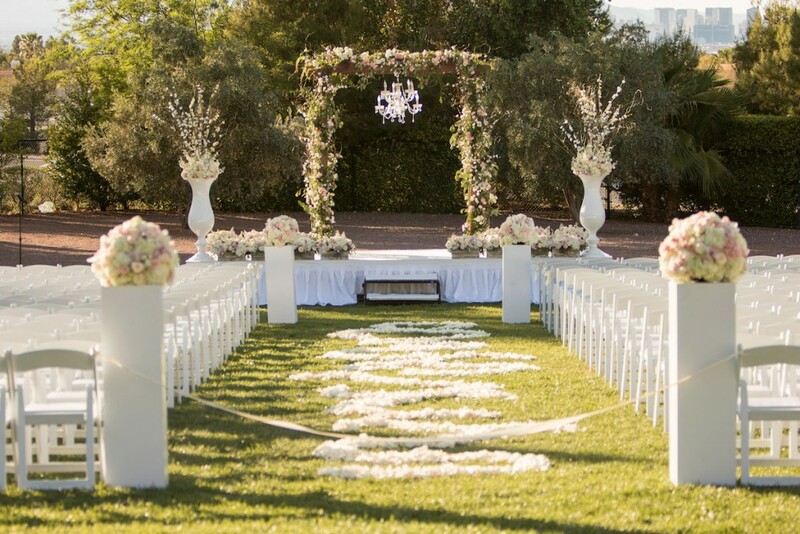 We brought in a natural wood arbor and dressed it up with a suspended crystal chandelier and tons of crawling vines and branches, accented with pops of blush and ivory roses. Floral By Dzign hand-crafted stunning altar arrangements of blush and ivory florals and blooming cherry blossom branches in streamlined white ceramic vases. Rustic, white-washed wooden boxes filled with lush blush and ivory flowers lined the altar, and we framed the front end of the aisle two white pedestals with blush and ivory floral toppers, which really helped define the space. We also created a fleur de lis rose petal pattern along the center of the aisle. Overall, the ceremony space ended up feeling magical, ethereal and super lush. After the ceremony, guests headed indoors for the reception, where we continued that same rustic-meets-whimsical aesthetic. Linen By Dzign did a stunning job of using layered linens to add depth and dimension to the guest tables. Round guest tables were dressed in navy blue luxe linen with a white mesh lace overlay, and rectangular guest tables boasted a white mesh lace linen runner. 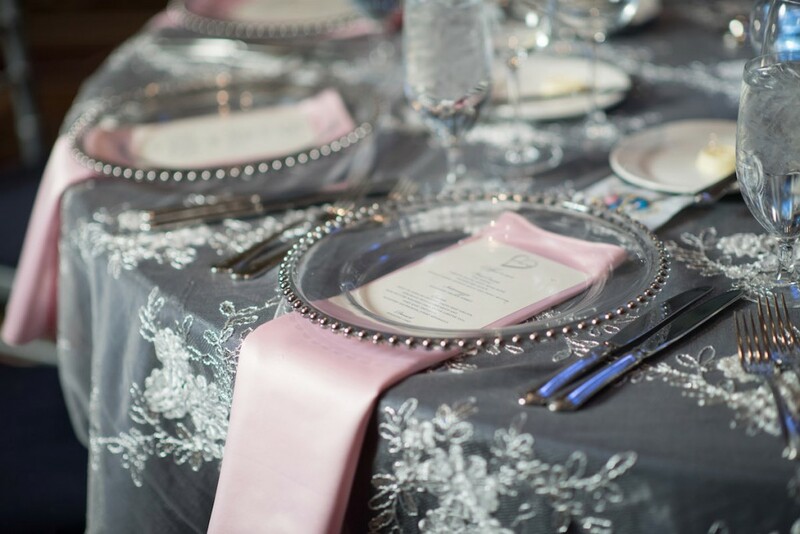 We finished each table with clear beaded chargers, blush napkins and silver chiavari chairs with navy cushions. Centerpieces included our tall veronica vase up-lit in white lighting, with a blush and ivory floral topper and silver mercury votives accents—and white-washed rustic boxes filled with lush blush and ivory florals, surrounded by understated bud vases boasting a single peony each. Mike and Aimee’s sweetheart table was flanked by tall, white ceramic vases filled with blush and ivory florals with blooming cherry blossom branches—which really helped to add some height to the space. We then dressed up the duo’s table with white-washed rustic boxes filled with blush and ivory florals, and pops of silver mercury votives. We placed Marquee letters from LED Unplugged in front of the table, which really helped to add a celebratory and personalized touch to the reception space. The couple’s cake was one of the most creative we’ve seen—it was reminiscent of carvings in birchwood, which played so well into their Malibu summer camp-inspired aesthetic. We dressed up the cake table with ivory roses, hydrangea and purple orchids. 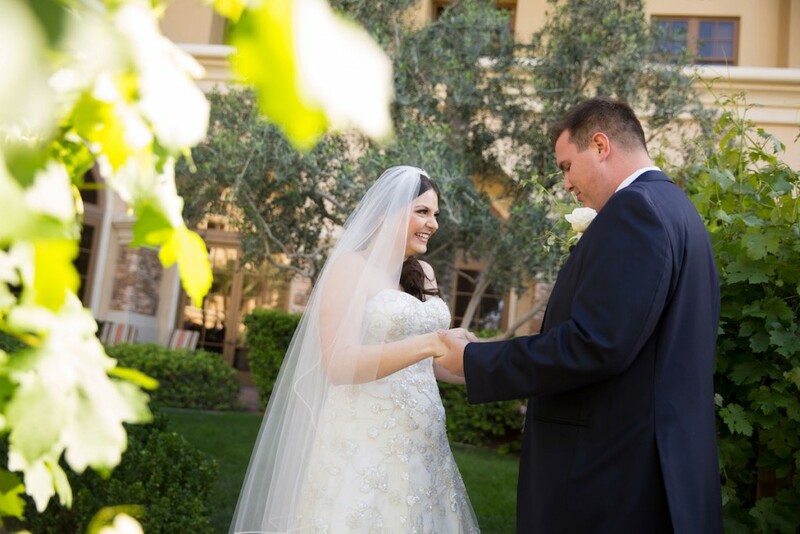 Overall, Aimee and Mike’s Las Vegas spring wedding was absolutely stunning, and we were so thrilled to work with such a beautiful couple (with a swoon-worthy love story) to bring this magical affair to life.